Art (r)evolution will be an unconventional art exhibition in France – at least as unconventional as its central topic: celebrating ten years since the invention of the first cryptocurrency, Bitcoin. The exhibition will take place between September 28 and October 5 on 15 Avenue de Messine in Paris. 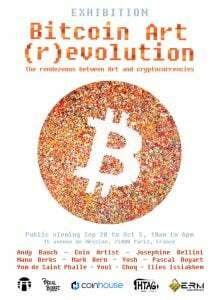 Aside from celebrating the upcoming tenth birthday of Bitcoin, the Art (r)evolution will also “show the potential of crypto-currencies through symbolism and practice”. Several artworks will contain hidden Bitcoin and upon purchase, the buyers will receive certificates of authenticity registered in the Bitcoin blockchain. “France, through Paris, is well positioned to become the capital of this new art form by bringing together art and crypto. Crypto Art is redefining the way an artist can engage with his audience. Cryptocurrencies here appear as more than just a monetary revolution but also a cultural revolution,” said Brian O’Hagan, Marketing Manager at Coinhouse, one of the sponsors of the exhibition. The overt scope of the exhibition is to raise awareness among people about cryptocurrency and blockchain. 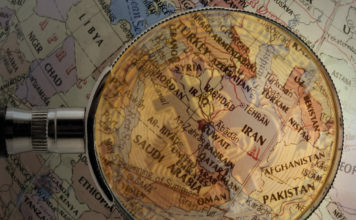 But it also attempts to help them make the transition to a new way of looking at money and monetary transactions. Anyone wishing to purchase one of the displayed artworks will have to pay with crypto: Bitcoin, Ethereum, Litecoin or Monero. At the same time, the exhibition will raise – and try to answer – important questions regarding the role of the artist in the modern world, the way rapport is established with the audience and the means of getting artwork sold without the need of middlemen. By its nature, blockchain technology promotes traceability and transparency – two important aspects in any supply chain, even that related to the sale of artwork. France: Youl, Yom de Saint Phalle, Yosh, Ilies Issiakhem, Choq and Pascal Boyart aka Pboy. The exhibition will be open to the public from 10 am to 6 pm and the entrance will be free of charge.